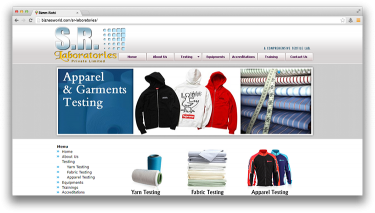 Description S. R. Laboratories, (SRL) was founded in 1996 to provide state of the art Textile Testing services to a variety of customers including Spinners, weavers, knitters, dyeing /printing unites, buying houses, all type of textile related traders and international leading stores. SRL also works for suppliers of military and other security forces to meet the performance requirement of these agencies and industrial concerns. Address B 9 / B 1, S. P. Chamber, SITE Karachi.